In the video workshop, belonging and non-belonging were explored through short films. 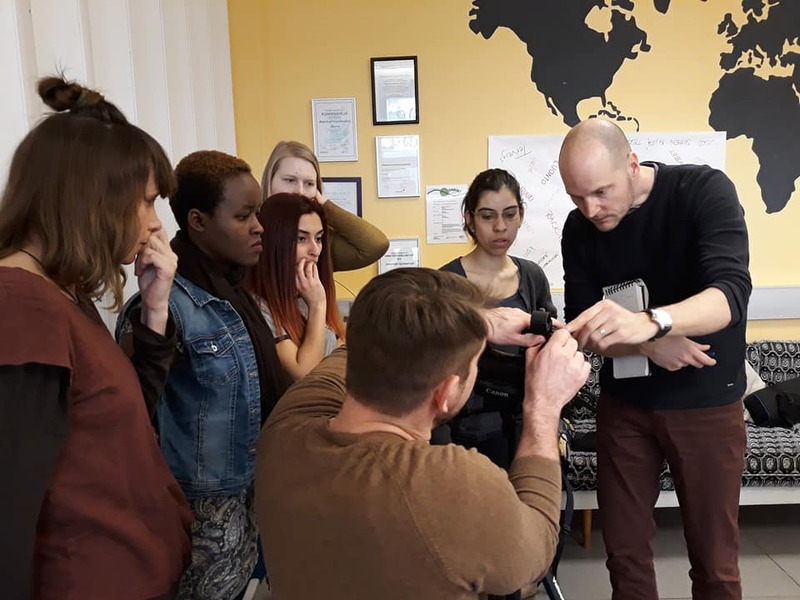 The workshop was open to all residents of Jyväskylä, who wanted to discuss belonging and learn filmmaking. We advertised the workshop in various social media groups and on local notice boards. We received ten enrollments and there were a couple of other interested people as well. We had usually about eight participants in the altogether 15 weekly meetings during the four- month period between late January and late May 2018. The participants, all of whom were adults, came from Afghanistan, Finland, Iran, Mexico, Nigeria, Tanzania and Turkey. The meetings took place in the international atmosphere of the Multicultural Centre Gloria, which was already familiar to many of the participants. It was a safe and an encouraging environment for the workshop. I worked as a co-leader and researcher in the workshop. Video journalist and teacher Ronan Browne worked as my pair. It was Ronan’s practical knowledge of filmmaking and teaching filmmaking that made the workshop possible in the first place. We planned the workshops together. The different phases of filmmaking (pre-production, production and post-production) gave the project a structure, but otherwise we did not have a strict, predetermined plan. Quite soon, we noticed that a good way to start the meetings was a discussion. We picked some themes for the discussions, for example, emotions, sense experiences or important places, but often these themes were just starting points for meandering discussions. 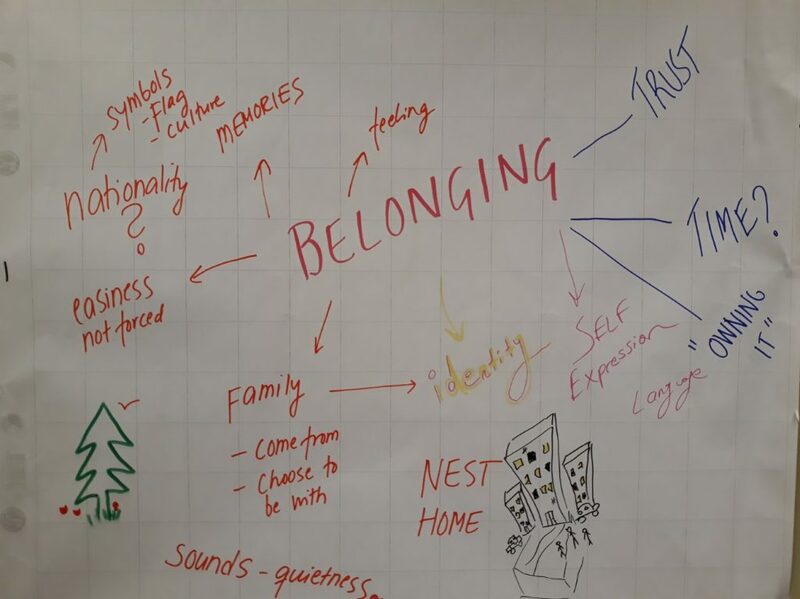 In the very first meeting, we made mind maps about belonging, attempting to chart what the term encompasses. Belonging is a huge and broad topic, as we came to notice many times. We asked everyone to bring to the second meeting a meaningful object. The purpose of the object was to inspire discussion about belonging and to get the group members to know each other a little more closely. Many brought practical things like a passport, while others brought personal items full of memories such as a piece of jewelry. The discussions were also a good moment to hear how people were doing, what everyone was up to and how the film ideas were developing. Everyone was free to say as much as they felt comfortable saying. Some shared personal experiences and some preferred to say less. The idea of the discussions was also to help the participants in their personal film projects. How to express ideas and experiences of belonging through film? How to find a specific cinematic form for those ideas? The actual film project started from these questions. The first challenge was to define a topic for the film and then gradually give it cinematic form. The participants weighed the pros and cons of fiction and documentary. It turned out that some form of non-fictional film would be the most practical solution because a fiction film would require more time and other resources. Ronan gave tips for ideation, for example how to sum up the idea of the film in one sentence. 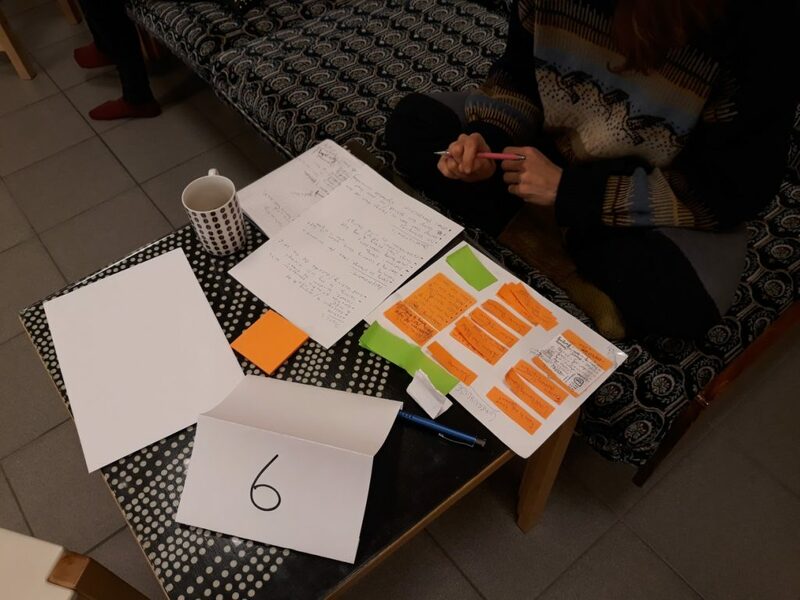 At about mid-point of the project, we arranged a get-together, where participants of all the three workshops (Video Workshop, Writing Workshop and Art Workshop) could meet, get to know each other and present their ideas to the other participants. At this moment, most of the participant already had a clear idea of what their films would be about. In the workshop meetings, working in pairs and in dialogue with the others was encouraged. The planning phase also included watching and analyzing short films. One of those films was Ghosts (2009) by Jan Ijäs. 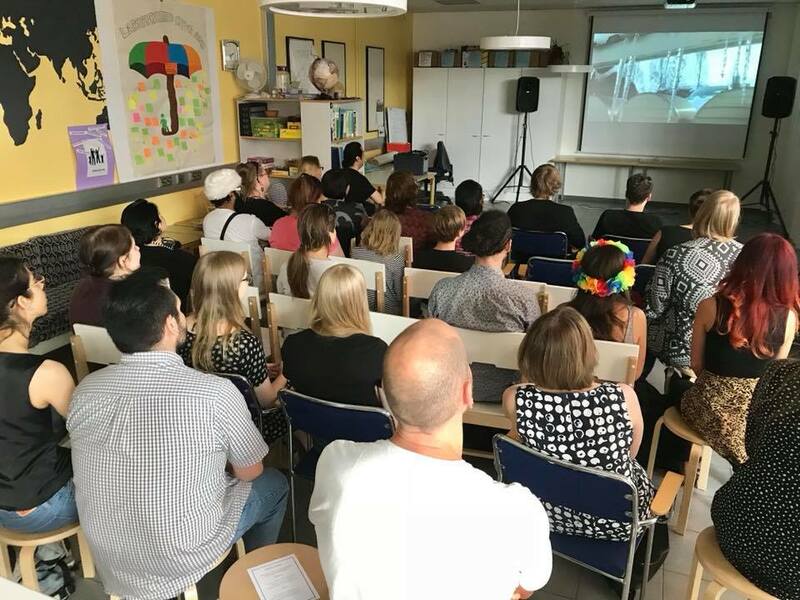 Ghosts is an experimental documentary about life in a Finnish reception center and it roused the only heated discussion during the project. Some of the participants had personal experience of living in a refugee center and they viewed the film rather critically. Who has the right to tell about life in a refugee center, was one of the questions asked. The pre-production phase lasted for five weeks until late March, when filming workshops started. From then on, the participants did various exercises with the camera, for example arranging and filming an interview and filming a short action scene indoors or outdoors. The material for the short film every participant filmed in his or her free time. After filming it was time for editing, the most time consuming phase of the project. It took about a month to edit the films. During editing, we no longer had time for any other activities. However, some of us continued to meet at the editing studio of the University of Applied Sciences. A couple of participants had their own editing equipment at home. Many of the participants had some earlier experience of filmmaking, but there were some, who had no experience at all, so they had to learn editing from the beginning. Luckily, there was always someone to help in the tricky parts. I am sure that most of the participants would have appreciated if they had had a few extra days for editing. During and after the editing I interviewed each of the participants, asking them to reflect on the different aspects of the project. It was a busy and intensive four months, a learning process in many ways. It was fascinating to be a part of this project, which often made me, a researcher, question my own role. Sometimes I took part in the group activities and exercises; sometimes I was more of an observer. In many of the workshop meetings, one or two other members of the Crossing Borders research team were present, took part in the discussions, and brought in topics dealt with in the other workshops. They took care that the discussions were recorded and they made ethnographic field notes, which gave me the freedom to be present and follow everything that was said and done. Just when I started to get some distance to the project and began to be able to organize my thoughts, preparations for the Crossing Borders exhibition started. At the time of the workshop we did not yet know, whether the exhibition would be possible. When we received extra funding for the exhibition, we knew that it would actually take place and we were very happy and excited. 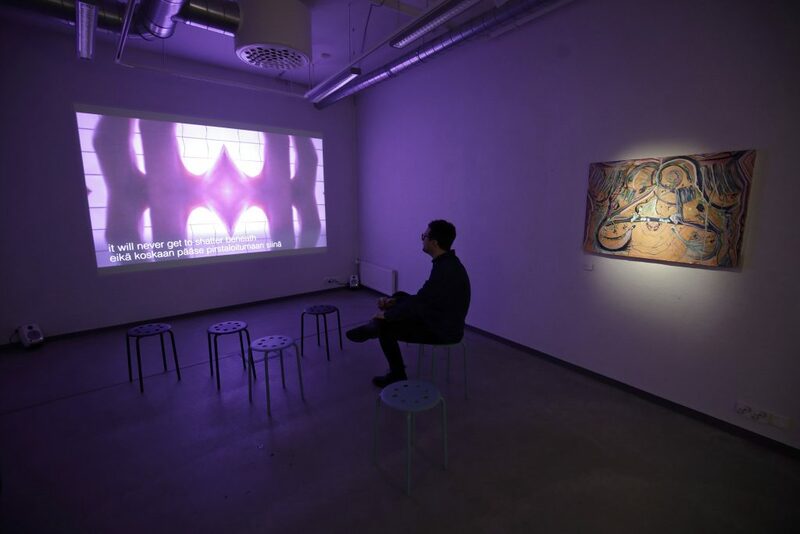 At the time of writing this, the seven films have been exhibited in gallery Ratamo for one month and more than 700 people have seen the exhibition! One year ago, the video workshop was in full progress, the participants were writing their synopses and testing their one-sentence summaries. Now that the successful exhibition as well is over, it is finally time to start going through the data and start analyzing what has actually happened. This is an interesting and challenging task because of the multidisciplinary and multi-method nature of the project. If I think about just the video workshop, it was about many things. For me the most fascinating questions right now are: 1) What kind of cinematic expressions of belonging did the participants create? 2) Which forms of participation (and belonging) emerged in the workshop? 3) How sense of belonging was negotiated during the workshop and how the workshop affected the participants’ personal sense of belonging?